Thursday, Apr 19, 2018, 4 – 5:30 p.m. This second annual event is free and open to the public. See 10 UW graduate student finalists from across the disciplines present their capstone, thesis, or dissertation projects in a fun and accessible manner without jargon--in front of an esteemed panel of judges and an audience. Each presentation is only three minutes! Graduate students will be competing for First Place ($500), Runner Up ($250), and People's Choice ($250). Plus, the audience will vote on who receives the People's Choice Award! Following the presentations is a reception with light foods and refreshments. 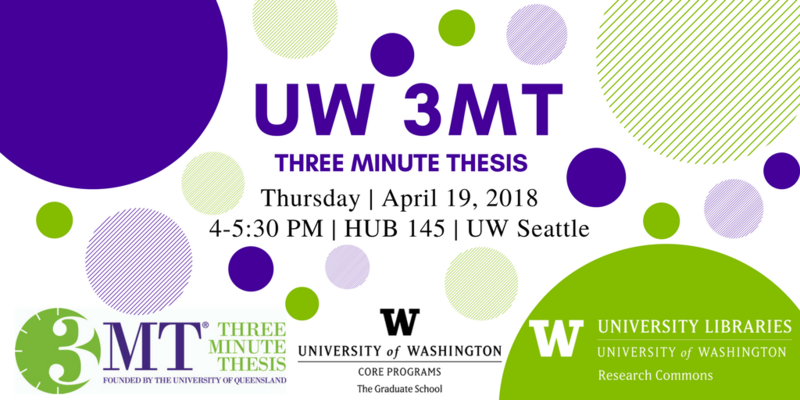 UW 3MT®—organized by Core Programs in The Graduate School and UW Libraries Research Commons—is a professional development competition that celebrates the exciting capstone and research experiences of Master’s and Doctoral students at the University of Washington. The competition supports graduate students’ capacity to effectively explain their research or capstone project in three minutes, in a language appropriate to a public audience. Three Minute Thesis (3MT®) is an academic research communication competition originally developed by the University of Queensland, Australia.